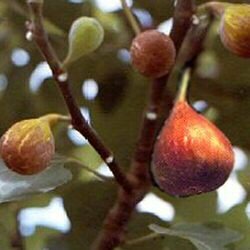 Figs are naturally a mediterranean fruit tree but the American Brown Turkey Fig is prized and refers to the color of its large ripe pear-shaped fruit which has a purplish brown skin with ruby red or garnet flesh that is very sweet and succulent. Delicious when grown fresh and very popular as dried. This sun loving tree is capable of producing up to three crops of their fruits per year. 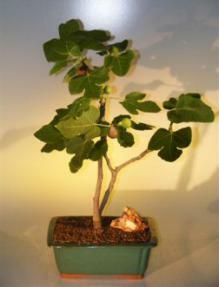 Figs do not need pollinating to produce fruits and fruit on the previous years growth. Deciduous. Keep outdoors. 8 years old, 13" tall.